Tracking your website’s traffic and analyzing reports gives you valuable insights how your website is doing, what your visitors are most clicking on, what they are searching for, and a lot of other data that you can use to get the most out of it. Google Analytics is second to none when it comes to statistics, data collection, analysis, and reporting. It’s the first choice of millions of users, website owners and digital marketing professionals, which allows them to measure and fully monitor the performance of their websites. 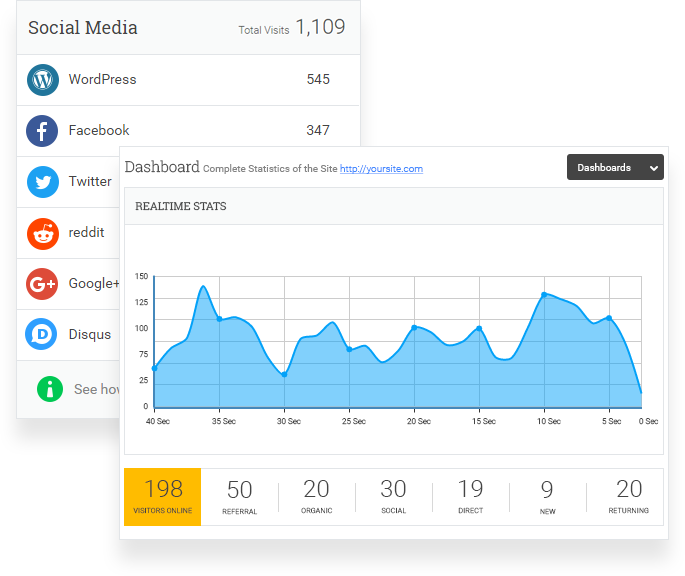 If you want to get the full picture of your website statistics directly from your WordPress dashboard Google Analytics WD plugin is right what you need. It’s the certified member of Google Analytics Technology Partners Program and brings the full package of analytics features to your WordPress website. 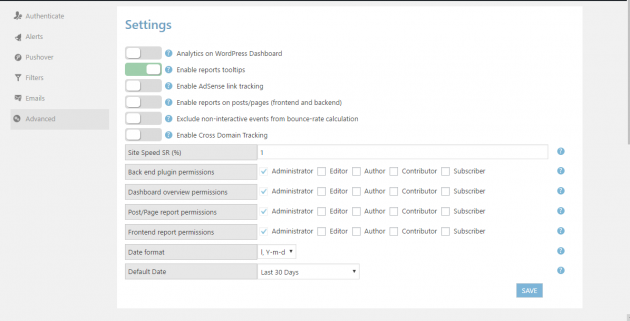 This WordPress Google Analytics plugin is distinguished with its custom reporting options, that let you keep the track of your website’s statistics in the way that’s most convenient for you. So’ let’s see how you can add Google analytics WD to WordPress website and start tracking everything that’s going on. To have Google Analytics WD up and running, you should first download it from the WordPress directory. It’s absolutely FREE to download and use, but for some additional features, you should go with Google Analytics WD PRO. After you have activated the plugin,it will ask you for the account authentication, that is, to grant access to the plugin to connect with your Google analytics account. You’ll have to submit the tracking code and you’re good to go. Once you have entered the code, the plugin will take you to the tracking page, where you can enable/disable some essential tracking options, such as anonymize IP addresses, tracking download and mailing links, outbound clicks, etc. You can also set custom tracking dimensions, which allow you to collect and analyze data that Google Analytics doesn’t automatically track. For example, you can enable tracking custom dimensions for logged in users, post authors, post types and publication years, and see which of your posts are read the most, or which authors get the most visitor attention. On the same page, you’ll find the tracking exclusion section, where you can exclude trackings by specific roles and users and not include any interactions from them in the statistics. The Overview section will bring you to the quick reports page, where you can instantly see the number of the visitors on your website at the moment, number of the users and sessions taken, browsers used to interact with your website, and the report of the user locations. Reporting functionality of the plugin is truly outstanding, allowing you to get insights into every single activity taking place on your website. The reports section is where you can find and analyze your website reports. There is an impressive number of report types such as, user and audience, demographics, technology, traffic source, site speed, SEO, etc. However, if there is a specific data, that you’d like to see in the reports, Google Analytics WD allows you to create custom reports for any metric and dimension, and access it on the reports page at any time. A common example of a custom report will be selecting Organic searches as a metric and Keyword as a dimension, which will help you to track the keywords that brought visitors to your website from search results. The reports are presented with charts in a very comprehensive manner. Choose between Line, Pie or Column chart types, and select one of the predefined Hour, Day, Week and Month time units for reporting. 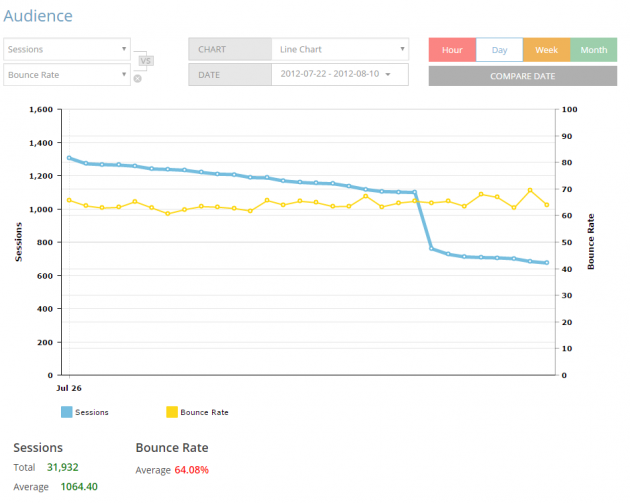 You can also choose a custom period for your reports and even compare the data from specific periods on a single graph. The reports can be exported in CSV and PDF formats, and be forwarded to a specific email recipients either manually, or periodically on a predefined schedule. Goal management feature is a super functionality that comes in handy when you want to track targeted activities and interactions on your website. It allows you to set goals, such as the number of page views/sessions or duration of a stay on page time that the users should complete. Under the settings tab, you’ll find the configuration options for alerts, authentication, pushover, filters, emails, and advanced settings. This is where you can set periods, conditions and values for alerts and pushovers, specify exclusions for traffic tracking, and enable/disable some of the essential features of the plugin, such as cross-domain tracking, Adsense linking, reports tooltips, etc. 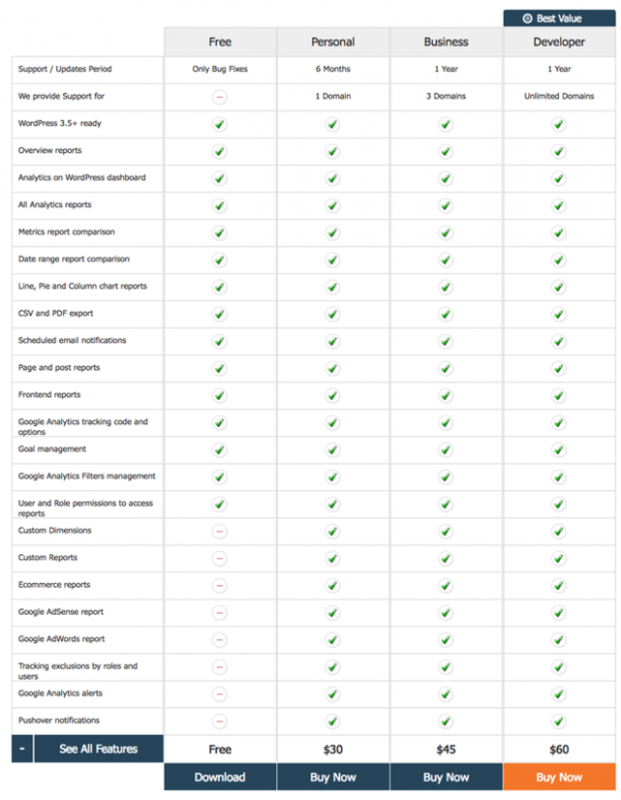 Find below the full list of Google Analytics WD features both in the FREE and PRO versions, learn about its pricing and see what you’ll get for the money you pay. Google Analytics WD is the most advanced WordPress Google Analytics plugin available. 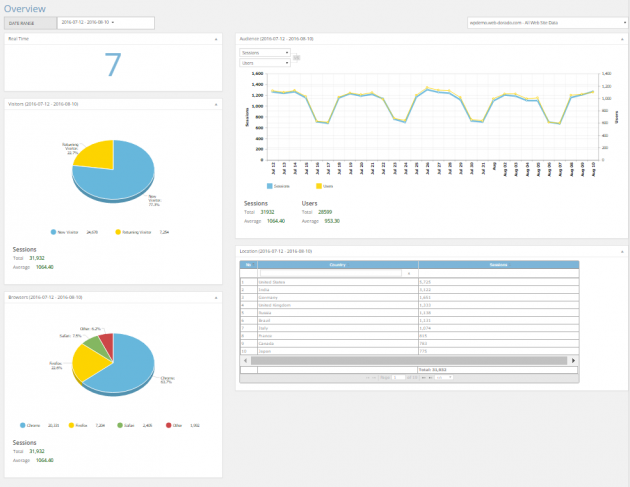 It comes with a set of unique features and cutting-edge functionality and is distinguished with its report visualization options, custom reports and custom settings, advanced goal management functionality, timely support, and lots of outstanding features that can’t be found on any other analytics plugin. It’s responsive so that you can access your website statistics with any device at your hand.